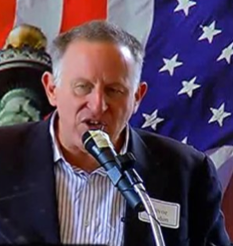 The 2014 South Carolina TEA Party Convention welcomes a modern-day Paul Revere, Trevor Loudon! Bring your friends to Myrtle Beach — this is too important to miss! “The Enemies Within: Communists, Socialists and Progressives in the US Congress,” is like no other book written on American politics. The book exposes, in layman’s terms, the comprehensive communist, socialist and extreme progressive infiltration of the US House of Representatives and the Senate. The book profiles fourteen Senators and more than fifty Representatives and their ties to the Communist Party USA, Democratic Socialists of America, the Workers World Party and The Institute for Policy Studies, Council for a Livable World and other radical anti-American organizations. Trevor has done the hard work to connect the dots of why the US Congress has moved further and further left over our lifetime and you won’t want to miss him. The Mid-Terms are coming. It’s time to clean House — and Senate! Get yourself prepared with facts. Don’t miss it! If your TEA Party, 9.12 or patriotic group would like to have Trevor Loudon speak, please contact Regina Thompson. part :) I care for such info a lot. I was seeking this certain info for a very long time.